A recent study explores the use of metabolic markers to target ovarian cancer stem cells and could improve outcomes of existing therapies. 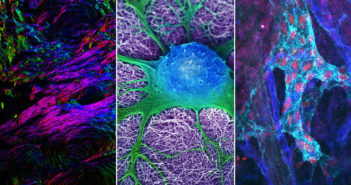 From 3-D printed hyperelastic bones to the nuclear membrane of immature red blood cells, scientific images bring to life the range of research published by Feinberg faculty and students in 2016. 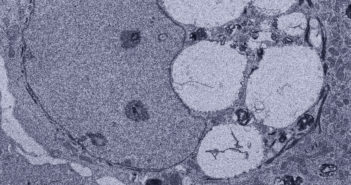 Northwestern Medicine scientists showed how a microRNA family regulates aspects of autophagy and macropinocytosis in the stem cell–enriched limbal epithelium of the eye. Northwestern Medicine scientists have identified a link between Huntington’s disease and dysfunction of the subthalamic nucleus, a component of the basal ganglia, a group of brain structures critical for movement and impulse control. Northwestern Medicine scientists have demonstrated an alternate method of signaling used by proteins called group I metabotropic glutamate receptors, a finding that could be used to develop novel drug treatments for many neurological disorders. Northwestern’s Cancer Survivorship Institute addresses the medical, psychological and social challenges patients face after their cancer is gone. Anne Langguth, MD, a third-year resident in the Department of Ophthalmology, shares how her musical background impacts her career in medicine. Ali Shilatifard, PhD, Robert Francis Furchgott Professor and Chair of Biochemistry and Molecular Genetics, and Karla Satchell, PhD, professor of Microbiology-Immunology, have been elected as 2016 fellows of the American Association for the Advancement of Science (AAAS).